My current choice of if you’re only going to download one item is Lebanon School District’s Guide for the College Bound Student Athlete. The example athletic resume is best as a content guide rather than formatting. However, it includes a good sample cover letter. One thing the guide includes is a recruiting funnel which should help anyone understand why a letter alone doesn’t mean you’re being recruited. You’ll also find information on the recruiting timeline, glossary of terms, the recruiting process, tips, and questions to ask. One thing to pay attention to is that it lists the NCAA approved courses for its own school. You should check with your own school for its NCAA list of approved courses. The download link is just below the page title. It a great resource to start with. Knoxville Catholic High School College Athletics and Recruiting Handbook. Detailed description of the recruiting process. Provides numbers of players who make it to the next level and what it means when a coach contacts you. Includes a sample letter, sample athletic resume, sample follow-up letter, and statistics to include by sport. Dated from 2011. Staples High School Athletics in the College Admissions Process Guide. Relatively short guide that includes one sample resume and one letter. Instead of repeating what’s found in the NCAA guide it actually lists their specific high school classes that won’t count towards eligibility and a short overview of athletic scholarships. Revised 2018. HS Baseball Web The Introduction Letter. 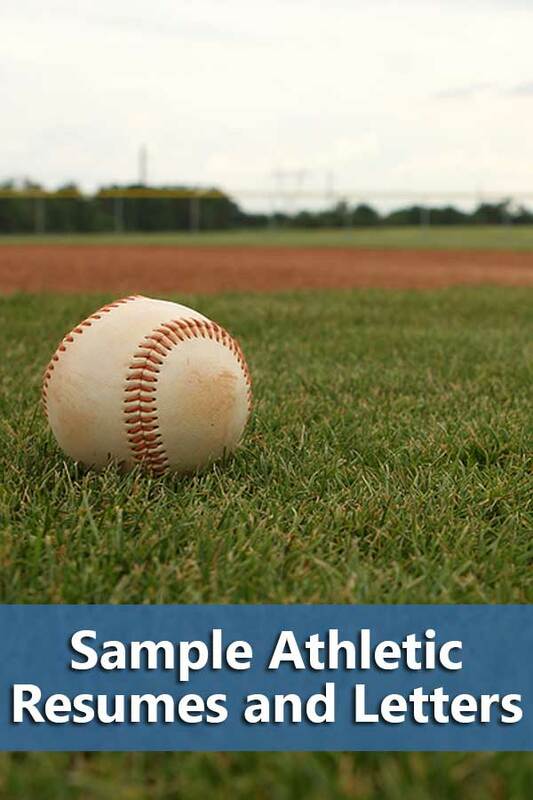 A basic sample geared for baseball players. However, the website includes a “Schedule” letter as well as an unscientific poll as to whether coaches prefer emails or letter. Orinda Aquatics Sports Resume, Cover Letter & Correspondence. Word document that has a sample resume, coaches letter, and samples of other letters to keep the coach updated including a thank you letter. San Diego Mustangs Rugby Sample Rugby Recruit Athlete Resume. Another sample resume but with a Rugby perspective. The website does include Top U.C. and CSC application mistakes that may not apply to your situation but are something you should check on just in case. Rush Soccer Communication with College Coaches. The usual sample letter and resume but also includes a phone script to use calling coaches. Exact Sports Sample Letters from Athletes to College Coaches. Provides 2 good samples and 2 bad samples, an initial letter and a follow up. CollegeHockeyInc.com 10 Steps to a Great Hockey Resume. Lists needed elements for the resume as well as a sample resume.